I am living a writer’s dream. We’ve only been in New York for a few days, but we’ve packed in weeks of writerly wisdom, months of ideas to contemplate. The agents, editors, and writers Xochitl and I have met have been generous, thoughtful, and helpful. Writers, there is hope as long as these good people are here! On Monday we met with Deborah Garrison, an editor at both Pantheon and Knopf. She told us about her fifteen years at the New Yorker, where she personally read through the “slush pile” of submissions and always hoped to find a voice unlike any other. It’s the same perspective she brings to her work now, whether reading poetry, fiction, or non-fiction. She said that the most important thing for a writer is to be true to oneself, to write what you must—not the story you think will be marketable. She said that the best writers appreciate editing that makes them better, and that they know how to recognize good advice without getting defensive. This is the reason I’m not interested in self-publishing: I want to learn from someone like Garrison, to become a better writer because of the perspective she can show me. Julia Glass calls Garrison an “incredible editor,” and now I understand why. When I met Tea Obreht (author of The Tiger’s Wife) last week at the AWP writer’s conference, she told me that her agent Seth Fishman was amazing—not just a great agent who works hard, but also a really nice guy. She was right. I met Fishman on Monday, and he immediately put me at ease, but also gave great advice. Keep publishing in literary journals, he said, because the people reading those journals are the same people who are going to buy your book. He also emphasized that authors should do everything they can to get the entire publishing staff excited about their books; editors sometimes move to other jobs, but your book will be okay if you have a team of people rooting for it. Fishman is a relatively young agent, but he’s made an impressive start to his career in a short time. On Tuesday I met with Gail Hochman (agent for Michael Cunningham and Julia Glass). “I’ve been doing this for a hundred years,” she said. Looking at the towers of papers in her office and hearing about clients who have called her while she was in the airport or the maternity ward, I don’t doubt that she’s packed a hundred years of work into the thirty-plus years she’s been doing this. She talked about the challenges of selling books, about how a story and its characters have to grab the reader in the first few pages or it won’t sell. When I asked her what she wished every young writer knew, she said to remember that everyone reading your book (even your agent) is a real person; they have a full life beyond their work with you, so cut them some slack. It’s been a true gift to meet with people like Garrison, Fishman, and Hochman. I hope I get to the opportunity to work with some of them. But even if I don’t, they’ve given me a little more faith in the world of writing, and on any day, that’s worth a lot. 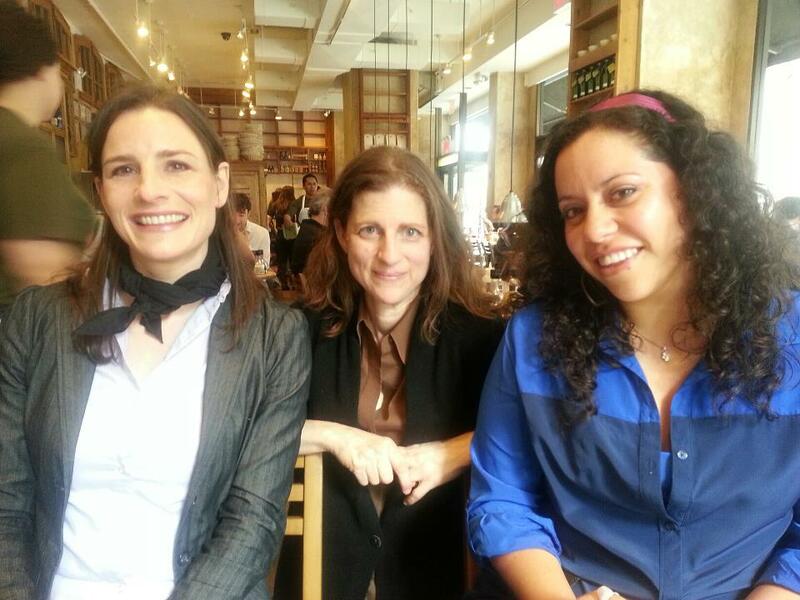 Photo: (left to right) Laura Joyce Davis, Deborah Garrison, and Xochitl-Julisa Bermejo. The California Writers Exchange contest is made possible by a generous grant from the James Irvine Foundation.